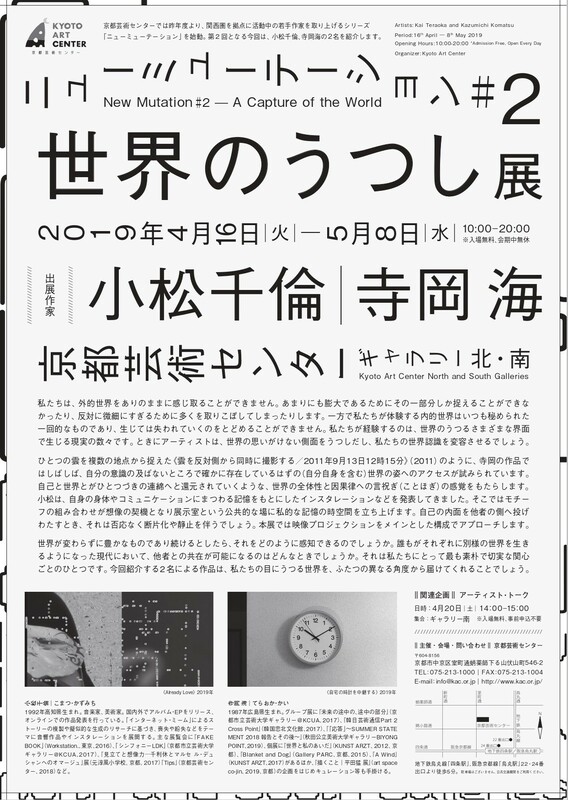 This spring Kyoto Art Center hosts an exhibition by two emerging artists based in Kyoto. Visit the installation by Kai Teraoka and Kazumichi Komatsu. We can never perceive the entirety of the world around us as it is. It is so massive that we could only capture a small part of it while it is so minute that too much slips away. On the other hand, the world we personally see is always a hidden and unique experience that inevitably comes and goes. What we see is various realities that occur on the interface the world is projected. Sometimes, artists would present unexpected aspects of the world that transform our perspectives. Kai Teraoka, as he did in his 2011 work "Photographing a cloud from the opposite sides at the same time 12:15, September 13, 2011", tries to access the being of the world that should surely exist yet stays beyond our consciousness and perception . The work celebrates the world in wholeness and causality and puts us in a renewed relationship where yourself and the world is united into one continuity. Kazumichi Komatsu has been creating installation work based on his own body and memories in relation to communication. The combinations of motives trigger our imaginations and create a private time space in an exhibition room, that is a public place. When projecting your personal experience into the others' side, it entails fragmentation and interruption. In this exhibition, a video projection based installation will be presented. We ask the most simple but actual questions: If the world still has a lot to offer, how can we experience its richness? In what situation would it be possible to coexist with the others now that everybody lives a different world? The two artist will present a capture of the world from two different angles.